The much-maligned “80-20 rule” seems to be an inescapable fact of the sales world. Many sales teams have high performers who bring in the majority of the business, while other sales reps struggle to keep up. Some sales people are good at closing or at nurturing leads, but if your sales people are simultaneously struggling with both issues, that is what creates the cavernous 80-20 performance divide on sales teams everywhere. So why are these two issues so difficult to connect and correct? Are you training your reps on how to advance deals as well as close them? Low success rates in advancing sales leads beyond the first call. Low performers tend to lose prospects before they even have a chance to develop a rapport or identify the prospect’s possible points of pain. Thus the pipeline of deals never reaches critical mass to reach sales goals. Lack of customization of early sales discussions and presentations: Low performers tend to take a one-size-fits-all approach to their prospecting, appointment setting and follow-up calls. This leads to a loss of good sales prospects, as the buyers get the feeling that the sales person isn’t concerned with their unique needs. Poor relationship building: Low performers tend to do too much talking and not enough listening on every sales call, often resulting in early termination of the sales call by the prospect. Narrow opportunity vision: If the prospect isn’t interested in the immediate sales proposition, then low performing sales people tend to be ineffective at asking follow-up questions and probing for other opportunities. Unable to dig deep in to product knowledge to discuss solutions on the “fly:” Low performing sales people tend to operate with a “calling script” mentality, and tend to have limited/shallow knowledge of the product. As a result, they miss opportunities to respond to customer questions and follow up with probing questions, thus limiting sales lead advancement. 20 percenters are sequential marketers. Great sales people know how to keep cycling a prospect through the various options available, depending on the prospect’s changing needs and shifting interests. If a prospect has an initial interest in product X and ultimately says they’re not interested, then the high performing sales person knows how to naturally and organically offer up product Y as a new option to keep the sale advancing. 20 percenters operate with “on board” internal sales diagnostics. They critique and fine-tune their sales process on the fly. They reinvent and adjust their competitive strategies based on real time “on the street” business intelligence data. 20 percenters are constantly learning and adapting based on the feedback (direct and implied) that they get from customers. How can sales managers help more of their 80 percenters to act more like 20 percenters and drive more business through the sales cycle? 1) Work closely with reps on shut down or early termination of sales leads that are preventing healthy pipelines from growing. The best way to move the needle on your sales goals is to expand the pool of leads – and that means improving your early appointment setting and follow-up calls. 2) Develop specific procedures for following up on sales leads. No winging it. Learn from the best sales people on your team and try to replicate their successes. The best sales follow-up doesn’t happen by accident; instead it’s an ongoing process that can be repeated and learned by others. 3) Develop comebacks for the top 10 most common objections heard on follow up calls. Train and test your reps in real time on their responses. Chances are your sales people are all hearing the same objections. Success lies in coaching your sales team to respond with greater consistency. Learn the shortcuts that your successful sales people have mastered, and share them with the rest of the team. 4) If sales leads respond as “not interested,” train sales reps to upsell and cross sell into other services and to make these attempts while on the initial follow up call. You might find that many of your “not interested” prospects will be interested in other offerings – but you need to start the conversation. 5) Monitor your reps while they are following up on leads to make sure they are implementing your follow up processes and procedures. Reps who have low hit rates on sales lead follow-up and closing typically complain that their problem is poor quality leads. Be skeptical and test your lead sources for yourself. And make sure that all of your reps are using consistent, focused processes for follow-up and lead nurturing. 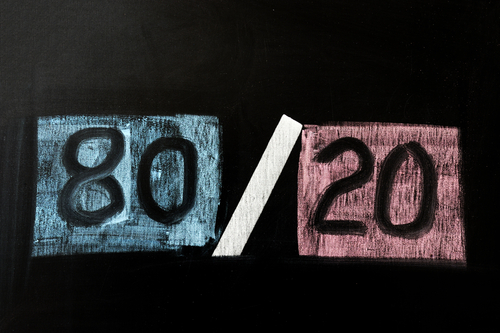 The 80-20 rule doesn’t have to be a limitation on your sales team’s performance. Instead, by emulating and replicating the best tactics and processes of your 20 percenters, you can help all of your 80 percenters improve their performance and drive bigger results for your company. Strategic Sales & Marketing (SSM) is a B2B lead generation and appointment setting firm that helps companies develop smarter strategies for sales appointment setting, sales lead qualification and lead management. Our team of experienced appointment setters and sales consultants have helped make over 50 million sales calls during the past 22 years.